Jade symbolizes the five virtues of humanity: wisdom, compassion, justice, modesty, and courage. It aids in access to non-physical worlds, while blocking any negative interference during one’s explorations. 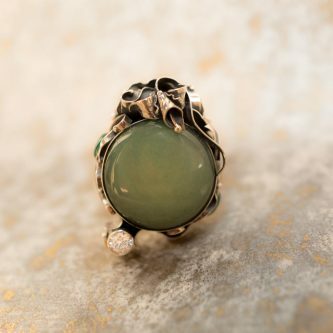 Jade allows its wearer to see past their self imposed limitations, to claim one’s natural resourcefulness, and to proceed with confidence on one’s life path. It facilitates harmony between physical, emotional, mental, and spiritual aspects of one’s personality, opening access to the Soul’s wisdom and inner power. Jade promotes courage from the heart, compassion, understanding of higher truths, generosity, humility, wealth, and longevity. Green jade brings peace and calm, clears depression and promotes lucid dreams. It amplifies confidence, kindness, and internal balance. It helps to stabilize a personality that is plagued by fears, and clears away nightmares. Physically, it balances the flow of energy through the meridians of the body, helps to clear physical fears, and aids kidneys in working better.